In this review, the reader stays current on the latest advanced techniques in the subject of Cardiac Anesthesia with a new section on cardiac critical care—the first of its kind in a MCQ format. Access comprehensive, problem solving guidance on quantitative aspects of TEE through twenty dedicated chapters on echocardiography with explanations, formulas, schematic diagrams and videos. Well suited for all candidates seeking for DM/FNB/FIACTA/Fellowship in Transesophageal Echocardiogram (TEE)/ FICCC examinations in cardiac anesthesia and cardiac critical care. 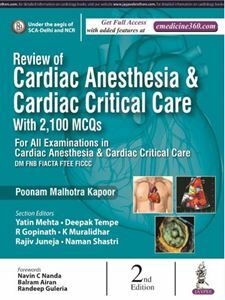 Special sections on echocardiography, extracorporeal membrane oxygenation and cardiac critical care form the essence of this MCQ Review. Online portions in echo with all echo modalities M-mode 2D and 3D both, TTE and TEE based taken mainly from references in Textbook of Cardiac Anesthesia by Kaplan, Echocardiography by Feigenbaum and Navin C Nanda and Extracorporeal Membrane Oxygenation (ECMO) guidelines by Extracorporeal Life Support Organization (ELSO) registry for all three sections, are included with latest updates. Buy by the chapter and never pay more than the price of the full book. Copyright © 2019 Jaypee Brothers Medical Publishers (P) Ltd. All rights reserved.